I met with Government and business leaders of Ghana Africa to consult on issues of health, education, communications, and trade issues concerning their nation. My invitation to meet with President Kufuor was personally delivered to me in Jacksonville by his friend, Bishop Vagalas Kanco, a Christian religious leader in Ghana. During my two-week stay in Ghana, I met with the president, his advisors, ministers, and numerous members of parliament. I was privileged to address many political and business meetings there, including the boards of Civil Aviation, Ports, Works and Housing, Education, Health, and other groups at his recommendation. Our meetings were very fruitful and opened many doors for me as I traveled throughout the country of Ghana in the business and trade negotiations that followed. 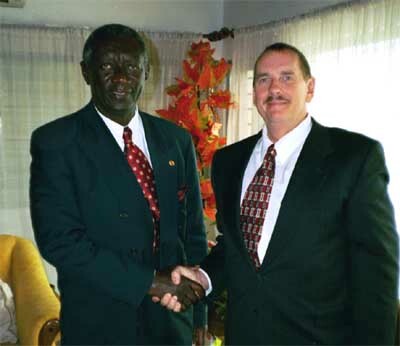 The picture above is of President Kufuor and me after our meeting. We talked on many issues and pledged a commitment to continue our meetings on my future trips to Ghana. 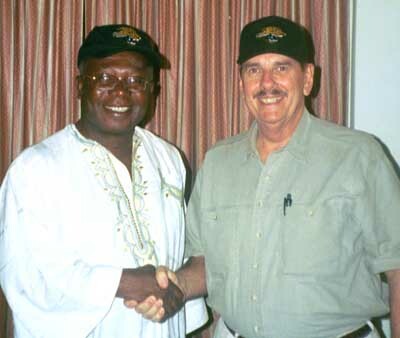 On the right is a picture of Dr. Kwame Tuffuor, Special Advisor to the President, wearing the Jaguar football team ball cap that I presented to him from The Jacksonville Chamber of Commerce. Dr. Tuffuor was educated in the U.S. and will be important in the future for Ghana. He was a valuable asset to me in many ways. Although I was provided hotel accommodations, I accepted offers to live with traditional African families, eat their foods, attend their Churches, and learn their culture. This was a blessing to me as I got a true feel for Ghana and its people. I made many new friends in Ghana and opened many doors. In conclusion, I can say that Ghana is truly the gateway to Africa. Its ports offer us opportunities to access the landlocked countries of central Africa for export of wood and forest products. Its people are friendly and hardworking, doing the best that they can with the limited resources they have. Although I visited hospitals and clinics, I didn't see evidence of AIDS as in other African Countries. From a business standpoint, the divestiture of government holdings offers tremendous opportunity for foreign investment in communications, manufacturing, construction, mining equipment, food processing equipment, timber and forest products, fish and fish products, just to name a few. I believe this government is stable and well founded in sound principles and would be a good business partner for U.S. investment and trade. I will be returning to Ghana soon to continue my business there and start our Ghana Aviation Branch of the Stephen M. Price Foundation. The foundation will also provide educational grants to Ghanian students in computer science, accounting, business, healthcare and other fields. I will update this page as we move forward.